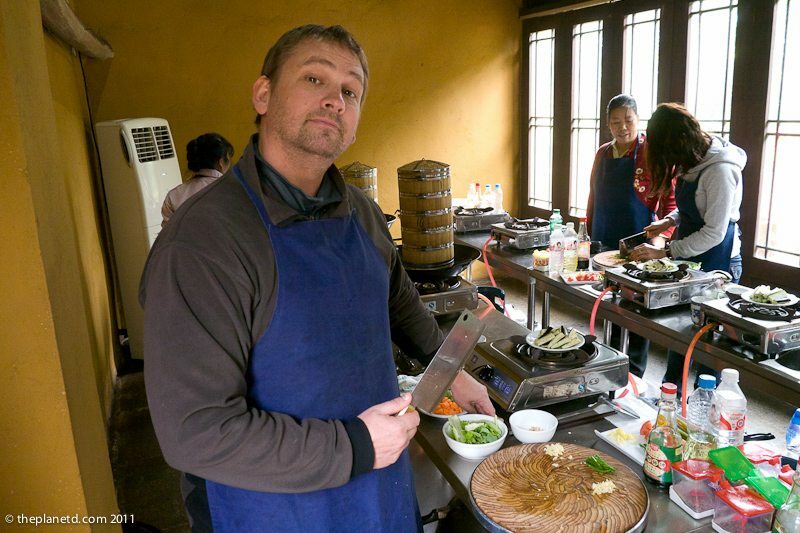 When visiting China, we took part in the Yangshuo Cooking School and it was a highlight of our time there. 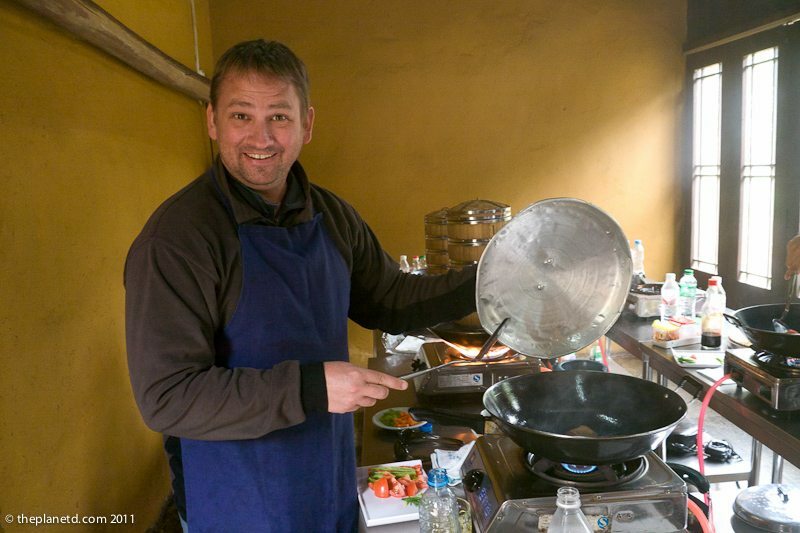 When were travelling through China with Intrepid Travel, one of the activities that were offered during our time in Yangshuo was to take part in a cooking course, so we thought we'd tag along. The market was alive with activity. It was exactly what you would expect from a traditional Chinese market. Rows of stalls were lined up in the giant hall displaying fresh fruits and vegetables. We didn't recognize a lot of the produce and were content to listen as our guide explained the use of each leaf, root and stem on the table. We thought that we would be prepared when she asked us if we were willing to walk through the live animal market and ignorantly said that we were fine. In Asia, people don't try to hide where their food comes from. It isn't tucked away in windowless factories and packaged in vacuum-packed plastic bags to be displayed on our grocery shelves. They don't use euphemisms like pork and poultry or beef in lieu of pig, chicken and cow. You see your dinner's eyes while they are alive and well, it can be very traumatizing. So if you do a cooking course in China, either be prepared for what you are about to see, or tell your guide that you don't want to walk through the next room. It is a disturbing sight but it is hypocritical for me to have meat as a part of my diet and judge the people who sell animals for my consumption. I just hope that China works on making animal welfare a priority in the future. From what I understand from all our guides, the younger generation isn't quite as keen on the practices of their elders. 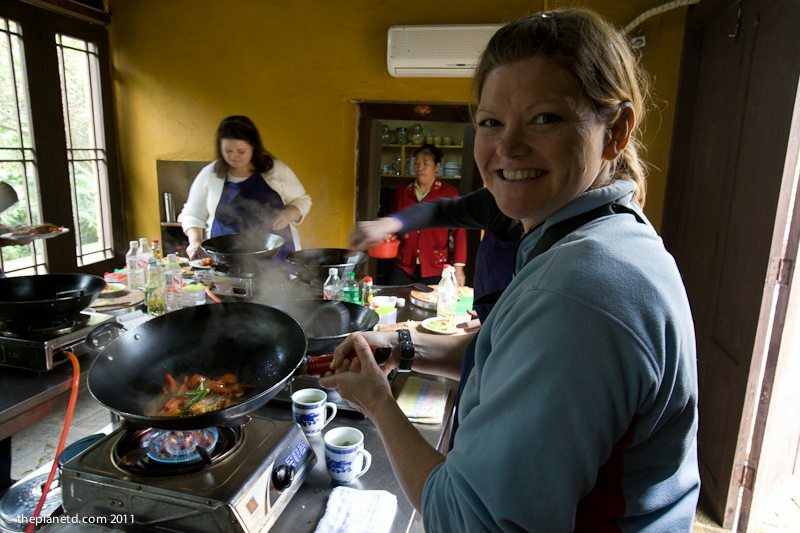 The Yangshuo cooking school ended up being a fun afternoon and a great way to find our inner chef. With our emotions melting away, we started off with learning how to make an array of stuffed vegetables. It was also nice to start with a vegetarian dish. The class moved at a feverish pace. We had a lot of dishes to cook and there was excitement in the air. The woks were sizzling and smoking while we chopped our veggies with our Chinese Cleavers. Dave was a natural cook, so I took my place behind the video camera to capture him slicing and dicing and swirling and twirling. We had an array of cooking utensils, pots and pans and bamboo dishes in front of our stations. If it weren't for our instructor I wouldn't know where to begin! We learned how to properly heat a wok and when to toss our fresh vegetables into the sizzling oil. We learned how to stuff veggies and mince garlic and ginger and we learned how to sear fish in a smoking hot pan. We learned how to properly chop our veggies too! There is a proper time to cut large chunky pieces and another time to thinly slice the vegetable of choice. It is important to think about how each food item will be prepared for each dish. We learned about produce from the region and how much spice is just the right amount of spice. You want your food to be filled with flavour. Spice should enhance the dish, not overpower it. However, each person has a different tolerance, so we all tasted our instructor's dish after watching the amount of spice she added to decide how much we should put in our own. Our afternoon feast consisted of beer battered fish to stuffed tomatoes, cashew chicken and seared vegetables, we had a feast and we cooked it from scratch. It was a satisfying experience to steam and stuff our own vegetables and display it all in one delicious array! We learned a lot about Chinese cooking and gained a new appreciation for their fine cuisine. There is a lot of work and preparation involved in preparing the various dishes that were served at our table each day and this, in turn, made us enjoy our dinners even more during our tour of China. It was an amazing way to spend an afternoon. We made such great friends on our Intrepid Travel, Grand China tour and our cooking class helped to bring all of us together quickly. Ok, there is no such saying but it is a good one, because our group definitely travelled well together after spending an afternoon bonding and eating at the Yangshuo Cooking School. 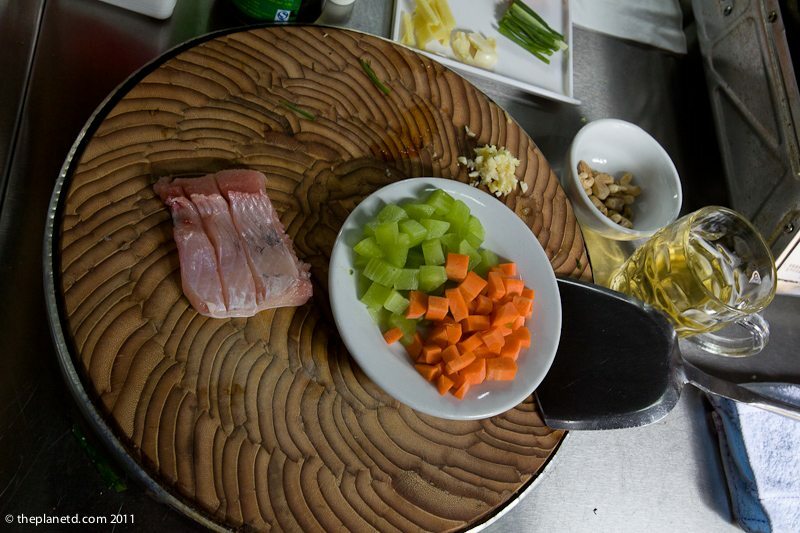 Want to the recipe from our Yangshuo Cooking School's staple dish? Half a glass of beer. 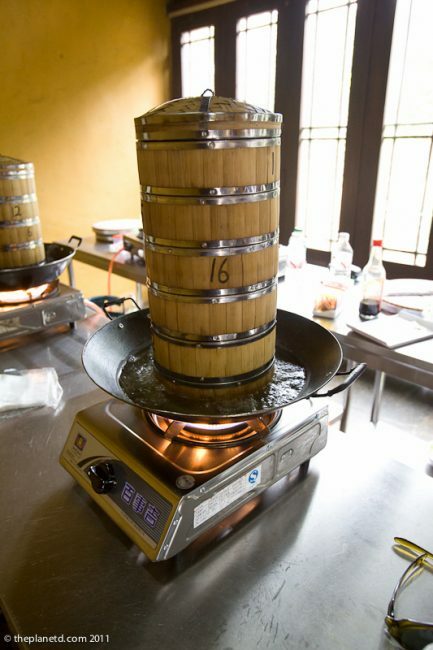 Heat Wok, Add Oil and Heat. Put fish into wok fish side down, put salt on top of fish. Fry on each side for 3 minutes to make sure the skin is brown. Put all veggies, garlic and ginger on top of fish. Pur on soy sauce and beer, cover for 5 minutes. 26 Responses to "Yangshuo Cooking School A Culinary Delight in China"
What a truly authentic and unforgettable experience. Great pics, thanks for sharing! Hi Donny, You are absolutely right. In North America we have this idea that if we don’t think about it or if it is tucked away we won’t have to worry about it. We need to realize that our food is killed for us to eat and that it was alive and well, just like the animals in the market before being slaughtered. I don’t think the conditions for cows,pigs and chickens are much better here in North America. I know that people are constantly working to make life better for our livestock, but who knows if it is working because it’s all done behind closed doors. We loved Yangshuo! Visited with my kids recently and it was the highlight of our trip to China. We have done a few cooking classes around the world, and they are always fun, especially for the kids, it helps them want to try new foods. 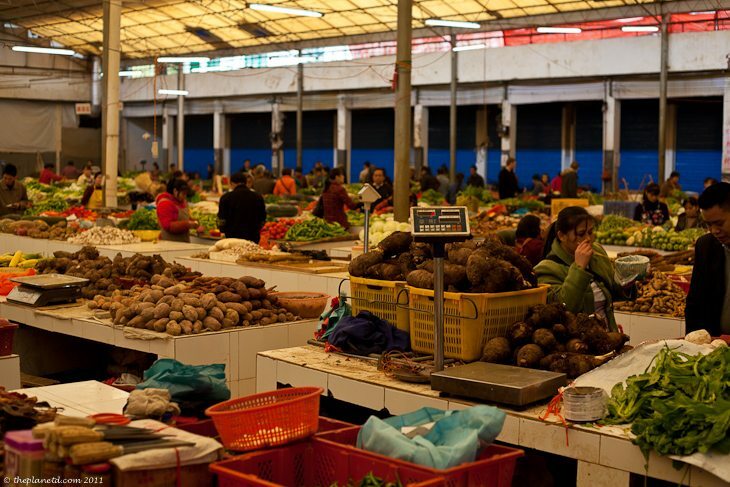 We loved visiting the markets too, checking out the fruits and vegetables you can’t get everywhere. One of our must dos on any trip is to find a fruit stall and try all the fruits we have never seen before! That is a great piece of advice. I’m going to do that when I visit my next market. I can’t believe I’ve never thought of that before. I love fruit, so I think that I would love trying them all. Thanks for stopping by! Great article. My boyfriend and I are planning a 2 year Europe Asia trip to start in the fall and have been following along your site for all sorts of tips and stories. 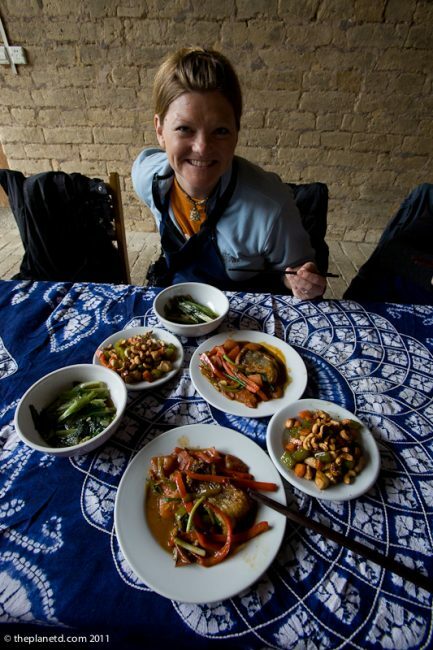 This article I find particularly interesting because aside from travel my life’s passion is food and cooking and I would love to visit various cooking schools during our travels. Currently I have my own food blog but when our trip starts we plan to run a travel website in which I want to continue documenting my culinary adventures as well! I definitely plan on looking into the Yangshuo Cooking School if we make it to that region. Hi Vicky, good luck on your upcoming trip, it sounds like it is going to be amazing. 2 Years of constant travel is very exciting. I definitely hope that you make it to Yangshuo, even if you don’t go to the cooking school, it is the most magical place in China. It’s truly beautiful. Hey Guys – Looks so good, I love the market photo. 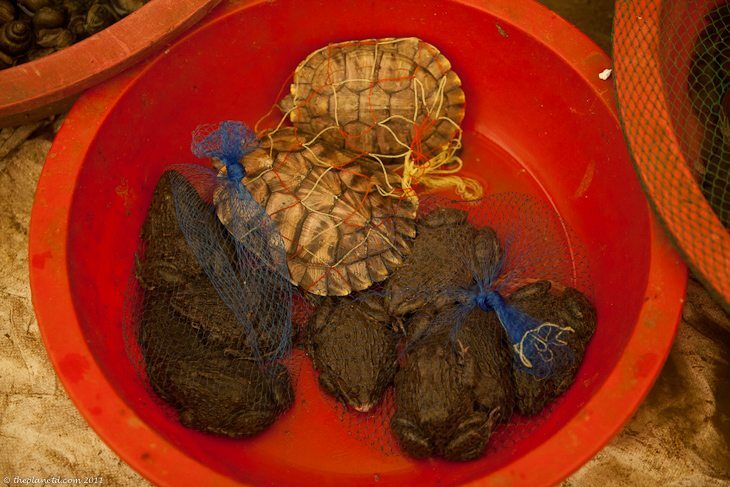 Although I don’t know if I could eat a turtle after looking it in it’s little eyes either…. I found the food in China to be an absolute mystery. Of all the places to take a cooking class. I bet just the market alone was fascinating! That is a good way to describe the food indeed in China…a mystery. The cooking course helped to understand their cuisine a lot and made for an excellent journey through the country. We ended up really having an amazing dining experience throughout the country since our guide was local and always made the best suggestions of where and what we should eat. Looked like a lot of fun. However I think I’d have opted for the vegetarian option – don’t fancy having eye contact with my lunch. Well said Ryan. I think that you can take the vegetarian option for cooking too. Hey Guys, that experience looks amazing. 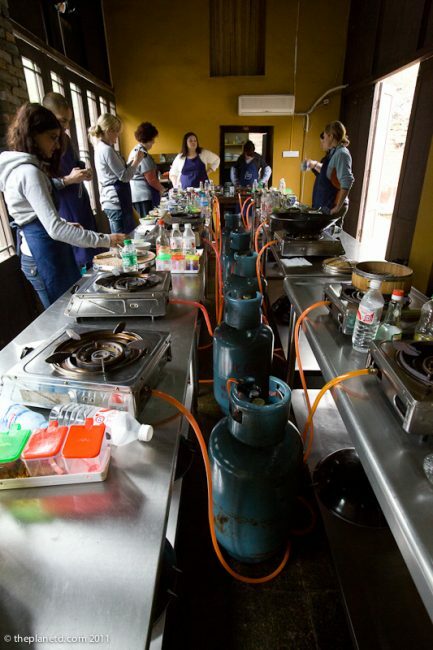 Cooking classes are awesome activities when travelling. I also think it’s real cool that you guys are travelling on an Intrepid Trip, they are an amazing tour operator. Looking forward to your next post, and exploring your older ones. Happy Adventuring! What an awesome place to take a cooking class! I would love to spend hours in that market. So envious of the lifestyle you have both created for yourselves. But please please tell me you didn’t have to do anything to those turtles of frogs for eatting……! 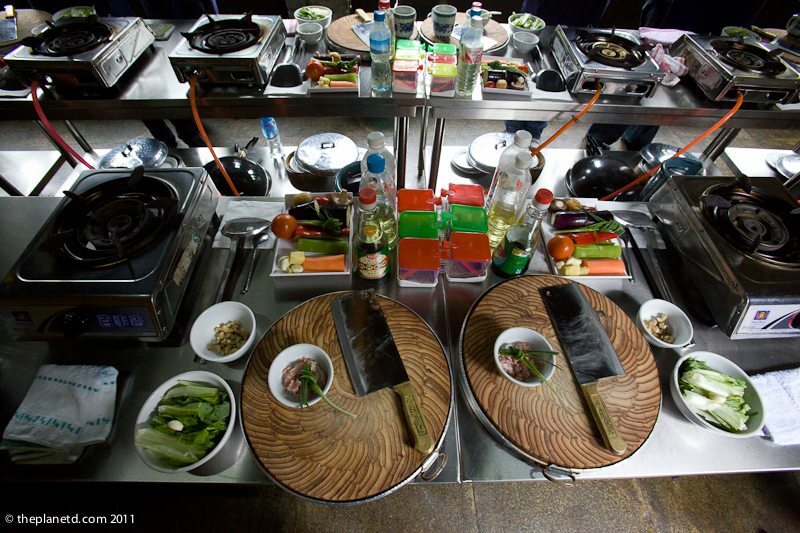 A cooking class is a great way to learn about a culture. One of the best experiences I’ve had in the past couple of years was a cooking class in Paris. And, now cooking classes have sprung up everywhere, just use Google to locate one. You are so right Lane, food is such a strong part of every culture so to delve into the cooking experience really gives you a first hand experience to the land and it’s people. We had such a great time I think we’ll do more of them on our future travels. Yum! It looks delicious! 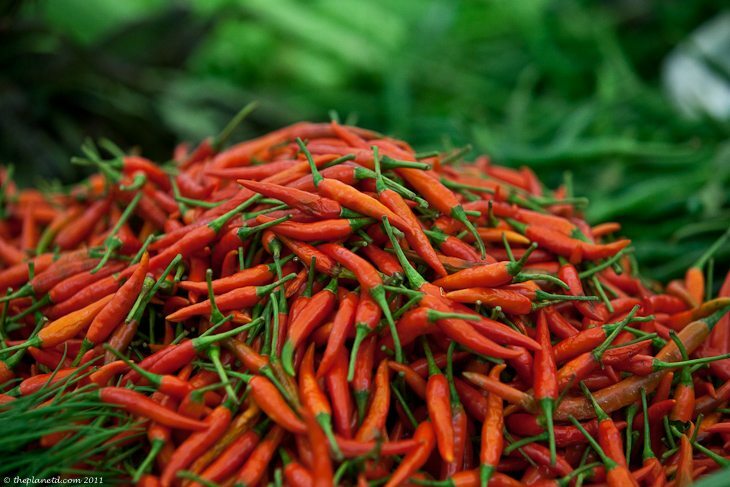 I think learning more about spices is one of the most important things for Asian cooking. One day I’d love to do a whole bunch of lessons on just that! 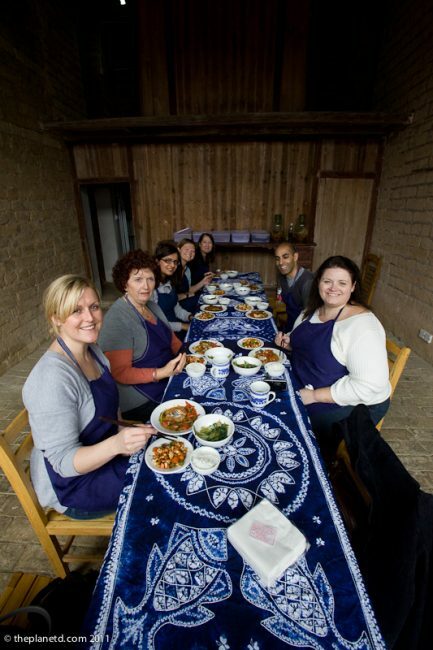 Can you believe we didn’t actually do a cookery course in China? I’m ashamed! p.s Love the chili shot! Yes, the markets in China can be pretty traumatic. I even felt bad for the scorpions in Beijing that had skewers through them, but only enough to hurt them and keep them alive so that they would squirm. Tough to look at, and yes, it’s difficult for Westerners to see dogs and cats in a food market indeed. Was the fish alive too when you bought it? Do they kill it there at the market? I think as meat eaters, it’s important to confront where our food comes from, as difficult as it may be. Hopefully they do improve the animal welfare in China though. Hi John, The fish for the cooking school was actually already bought and chopped. We only bought produce at the market. I think that they probably knew it would be too much for us Westerners to buy our food alive and take it back to eat, but I agree with you, as meat eaters we can’t turn a blind eye to where our food comes from. In other parts of the world they don’t sugar coat what we are eating, in the West we are too removed from our food. We have animal welfare problems as well with our chickens in battery cages and slaughter houses so I really should have said that I hope animal welfare improves all around the world.